Prospect 3.0 ultrasound system from S-Sharp provides researchers with real-time and non-invasive image acquisition capabilities for in vivo and longitudinal studies on animal models. With its high frame rate and impressive sensitivity, it is capable of visualizing fast moving events such as blood flows and heart motions, as well as micro-vasculatures on mouse models. it is capable of imaging wide range of animals ranging from mice to rats to bats. 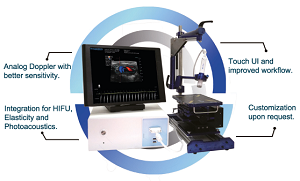 S-Sharp is dedicated to provide cutting edge ultrasound solutions to the customers. Their ultrasound system showcase rapid advancement of electronics technologies at S-Sharp combined with powerful software computations. The Prospect 3.0 ultrasound system is an open platform designed to streamline the workflow and enhance the quality of small animal research. Prospect 3.0 from S-Sharp is a small animal ultrasound imaging system with a spatial resolution up to 30 μm. It is equipped with Virtual Array (Synthetic Aperture Focusing Technique) for improved image resolution and depth of field. It is capable of doing real time color Doppler imaging and triplex imaging in update mode (B/PW/Color). Connectivity to external devices, such as a laser, a HIFU transducer, or a source for generating radiation force, allows extended capabilities including photoacoustic imaging, sonoporation and elasticity imaging. It can save static or dynamic data in multiple data formats including raw, jpg, tif, bmp, DICOM, cineloop (up to 1000 frames) and avi. Connectivity to external devices, such as a laser, a HIFU transducer, or a source for generating radiation force, allows extened capabilities including photoacoustic imaging, sonoporation and elasticity imaging. • Save static or dynamic data in multiple data formats including raw, jpg, tif, bmp, DICOM, cineloop (up to 1000 frames) and avi. Up to 190 fps ( ECG mode). Effective frame rate up to 1900 fps in offline review mode.